In most cases, I consider the difference between a repair and a restoration to be a matter of degree. 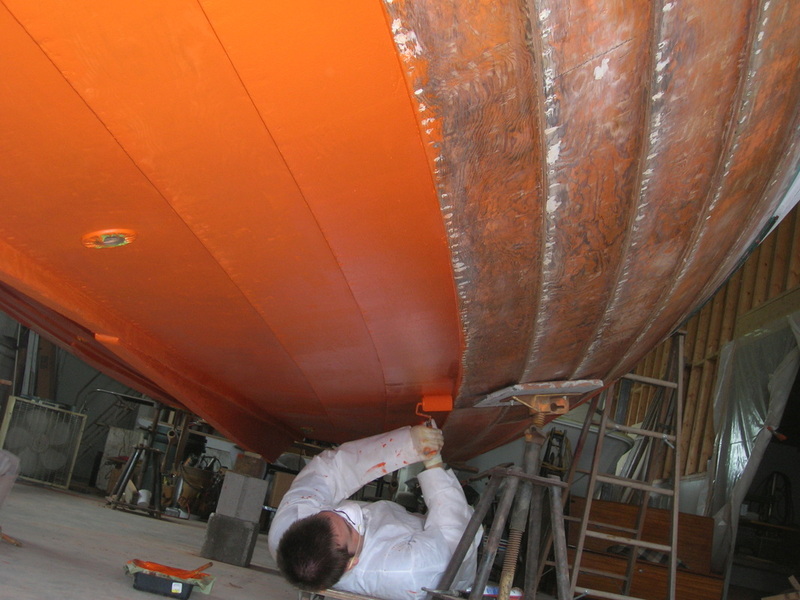 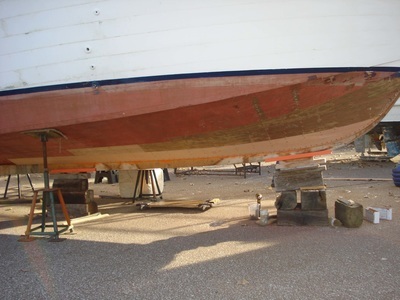 A repair generally addresses specific damage to a particular element of the boat while restoration encompasses the whole boat and its systems. 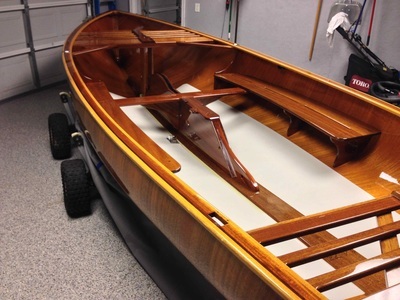 My favorite repairs are those where the owner can smile again after some form of heartbreaking damage has occurred to his pride and joy. 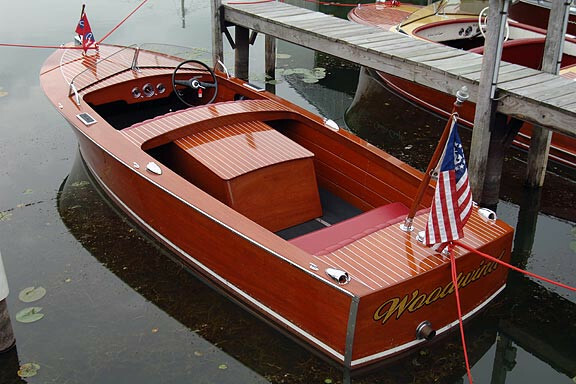 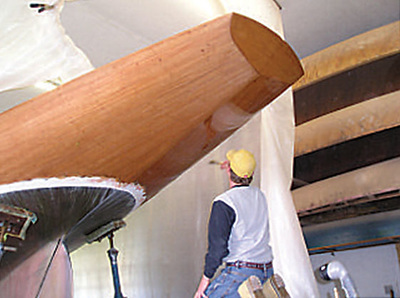 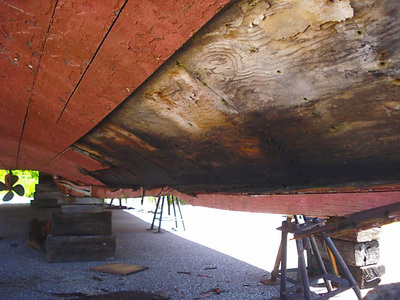 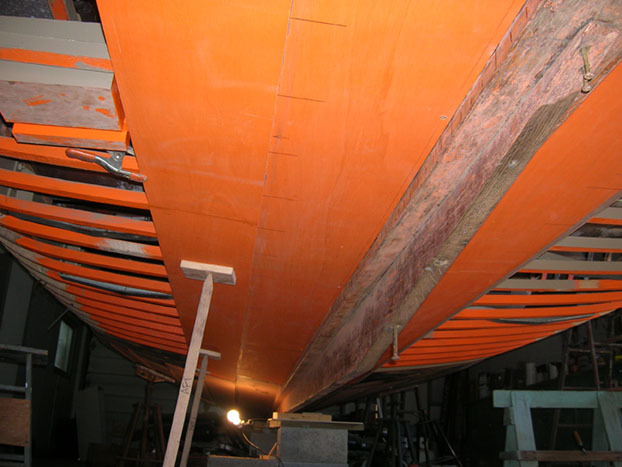 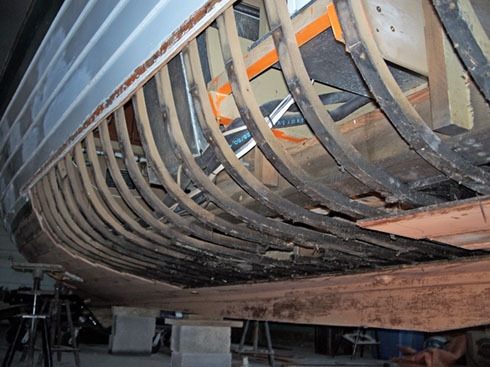 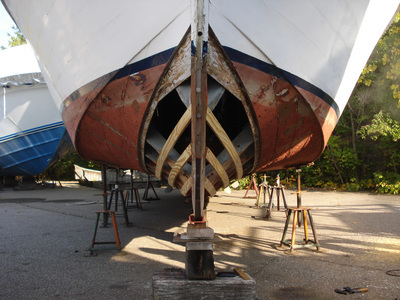 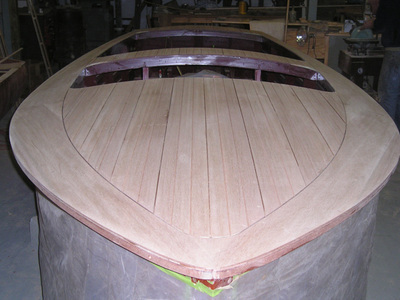 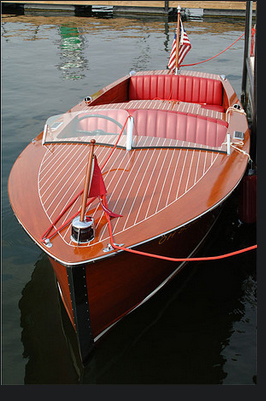 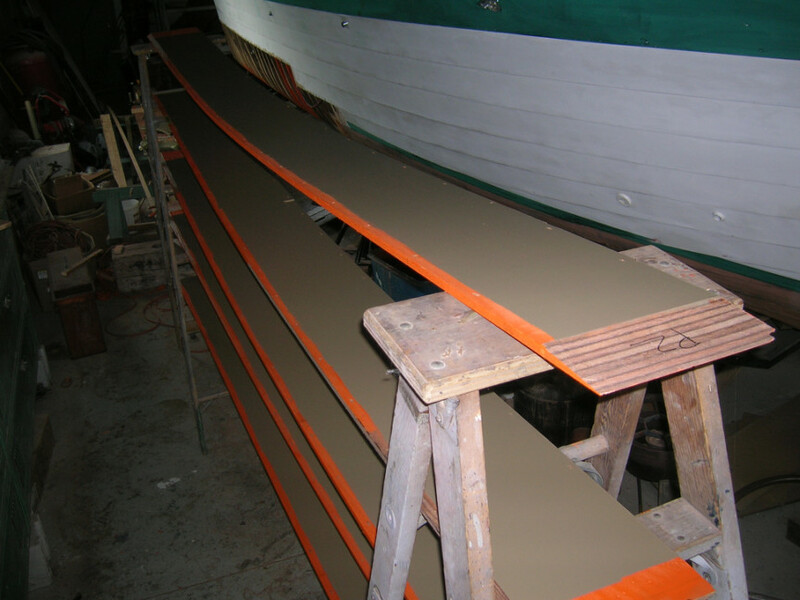 ​On the other hand, wood boat restoration is the process of returning the entire boat to its original, like-new (or better) condition. 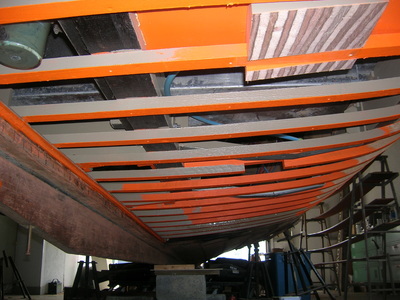 To my mind, it's the next best thing to new construction! 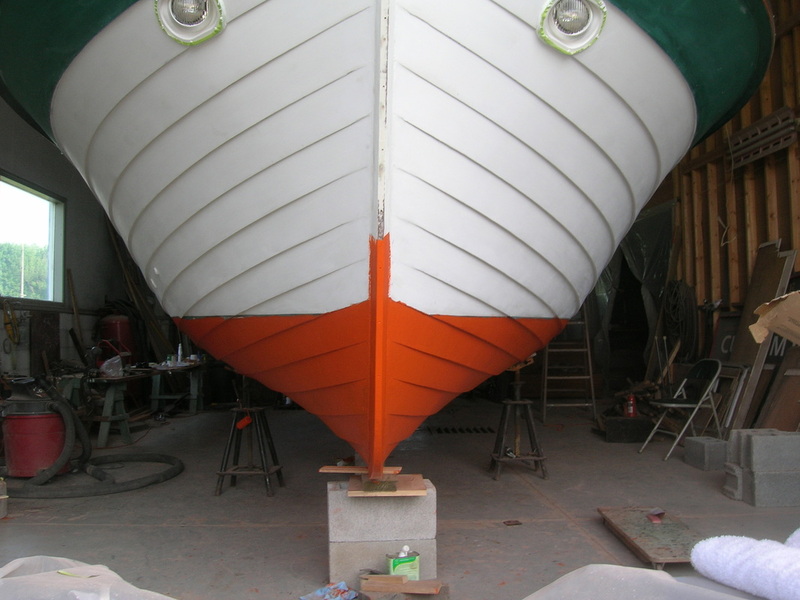 So whether you need repair due to accident or age, or a full restoration to get back to a like-new condition,​ call or email me for help in planning your next step. 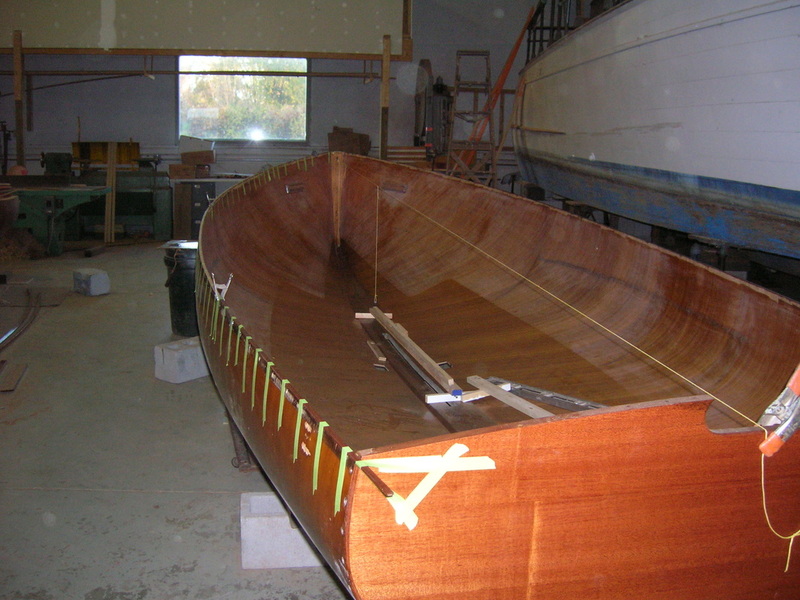 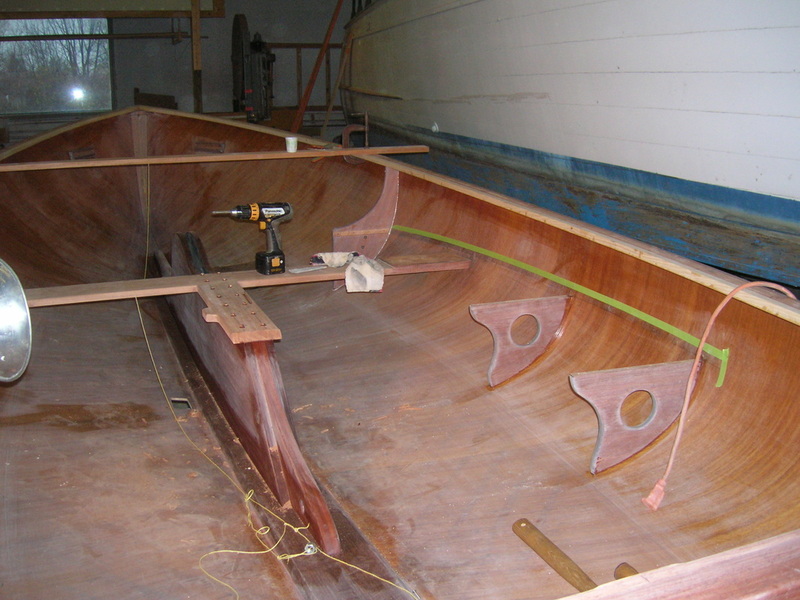 Over the years, my shop had already performed many upgrades to this 30' Lyman including new teak decks, a new transom, wiring upgrades and all new exterior finish among other less major work. 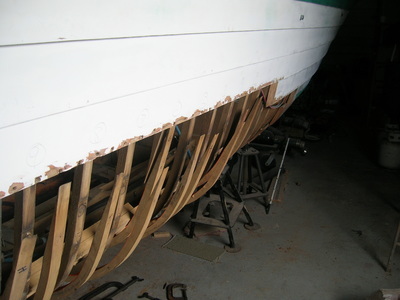 When it finally became necessary to make repairs to her aging bottom planking and frames, the decision was made to address the worse aft half of the hull first, possibly completing the forward half at a later date. ​The following photos show some of the repair process in which we steam-bent new frames in place with glued scarph joints in the straighter topside sections. All new aft planking scarphed to the forward sections completed the job. 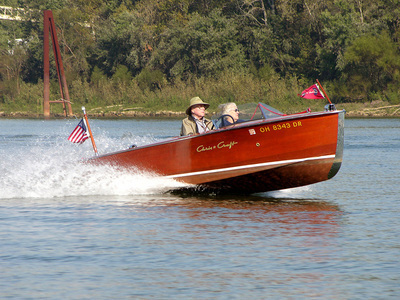 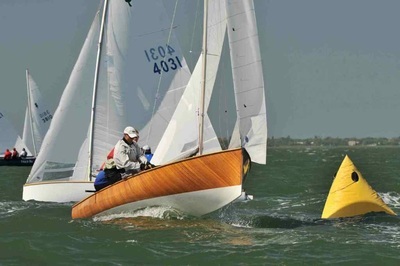 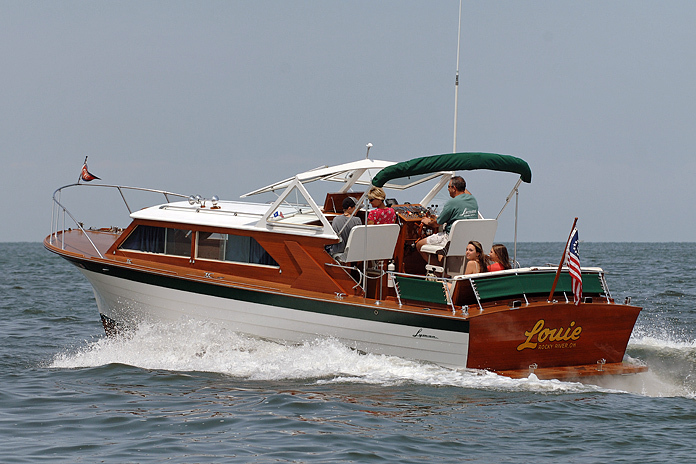 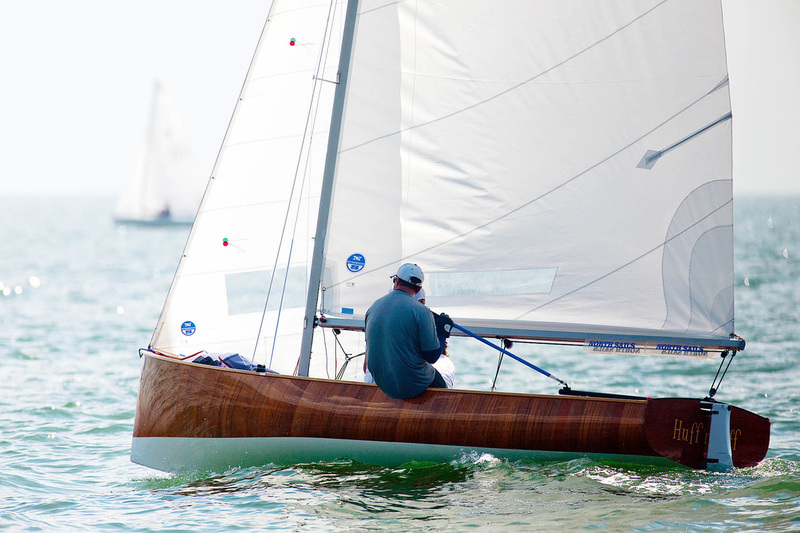 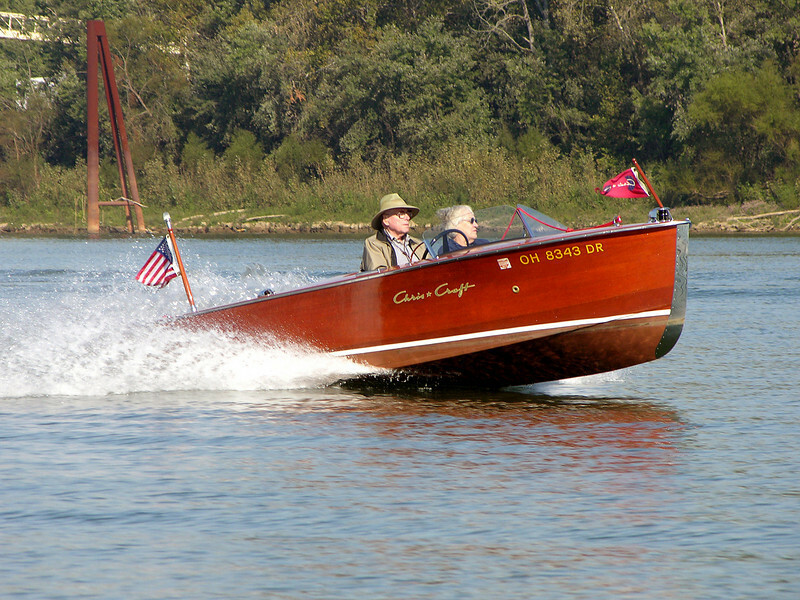 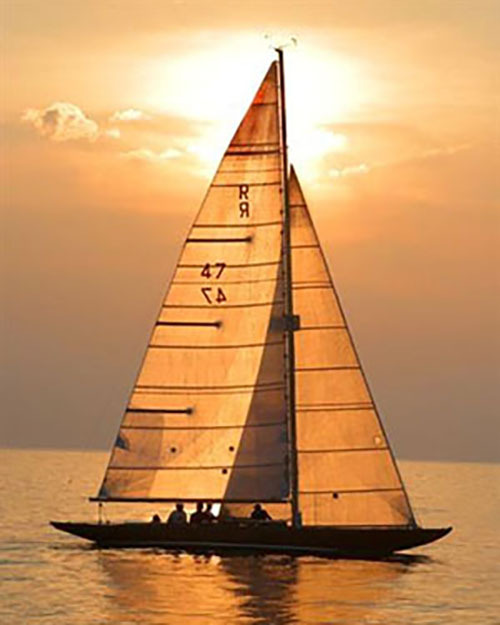 The Cleveland Yachting Club is home to Ardette, one of the oldest R boats still being raced on a regular basis. 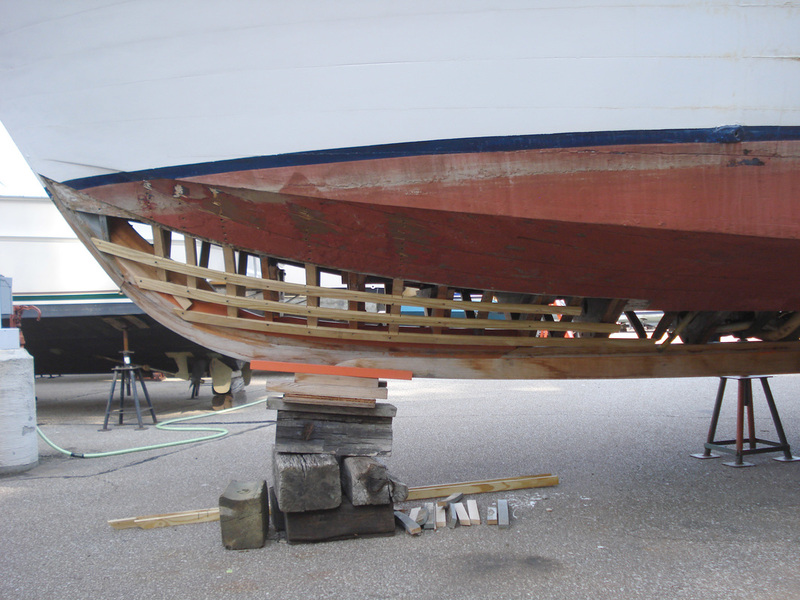 An unfortunate collision brought her to us for a new outer stem and forward plank repairs. At the same time, we replaced frame heads at her port chainplate and aft on her starboard sheer, fashioned a new port chainplate, replaced 30' of covering board, and replaced a 2' x17' section of scarred topside planking on her port side. 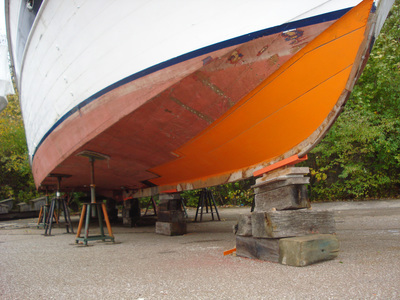 A multi-step staining process was used on her bleached topsides to return her color to the matched even tone she was known for. Twelve coats of varnish completed the job. 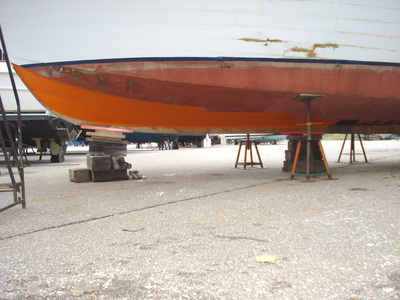 ​The keel broke where it bore the weight of the front half of the boat on the yard trailer's cross beam. To make matters worse, there was considerable rot damage to the keel, forekeel, stem knee and a number of the sawn and intermediate frames. 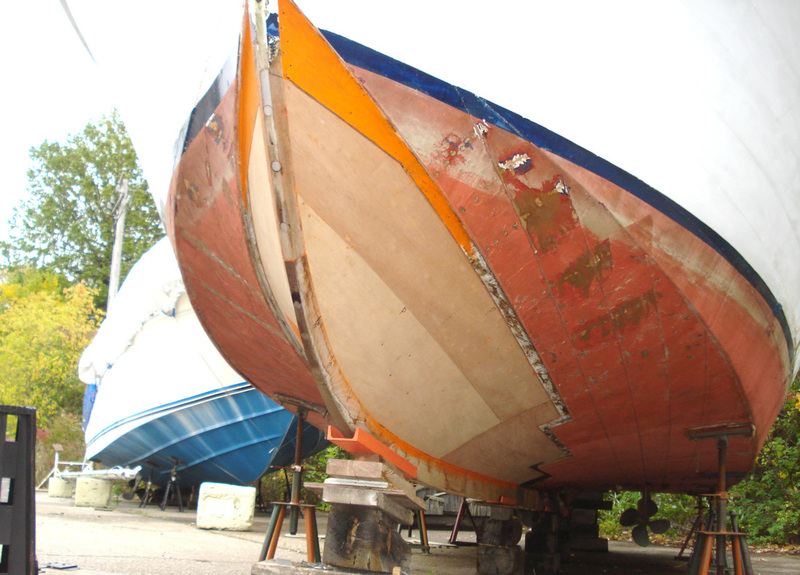 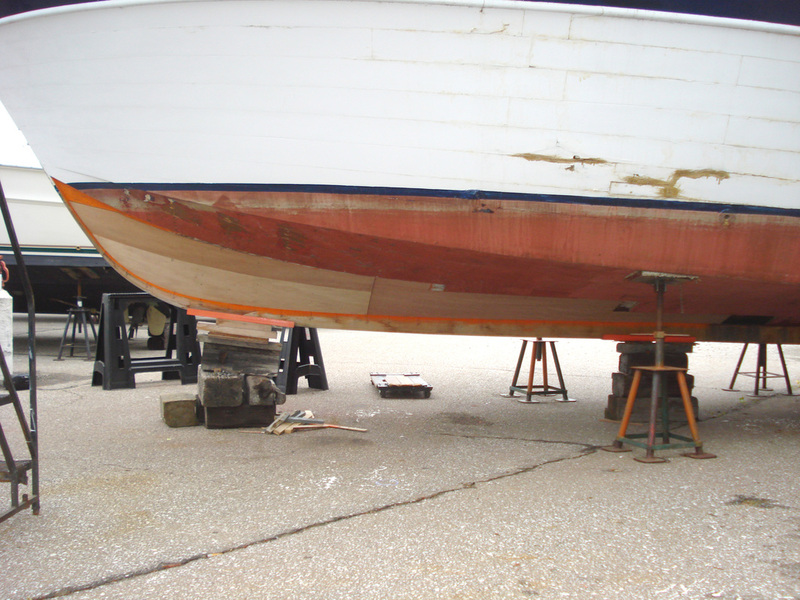 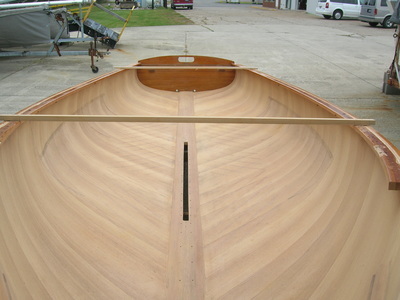 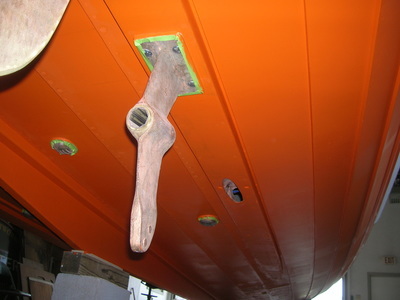 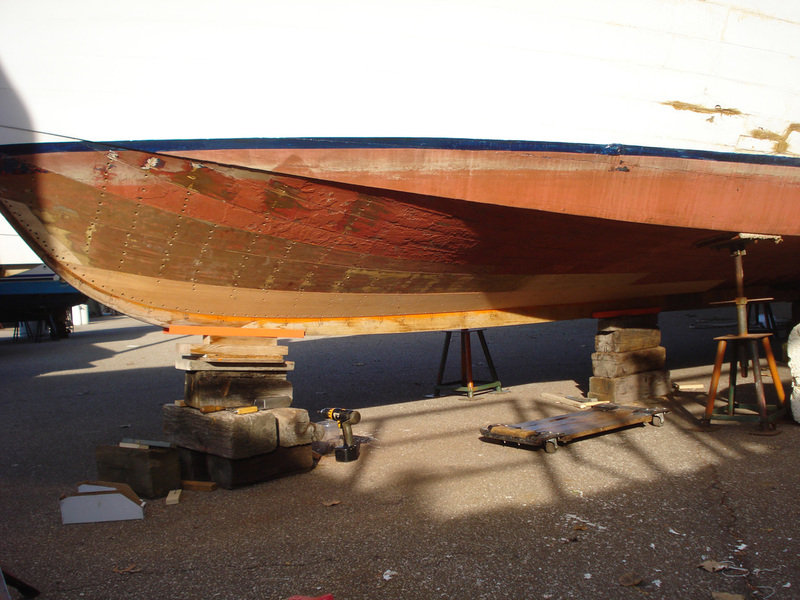 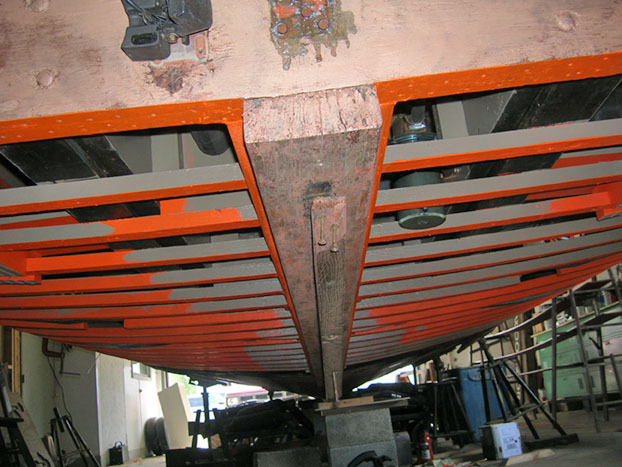 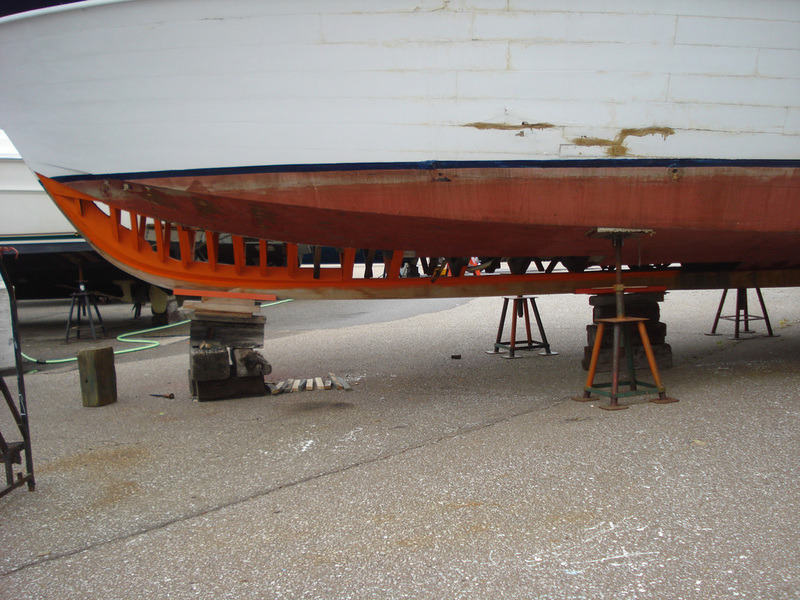 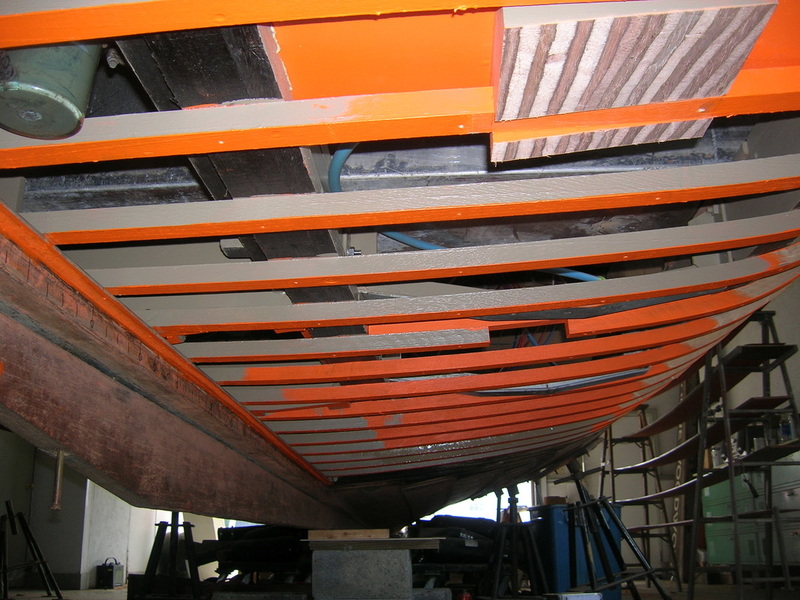 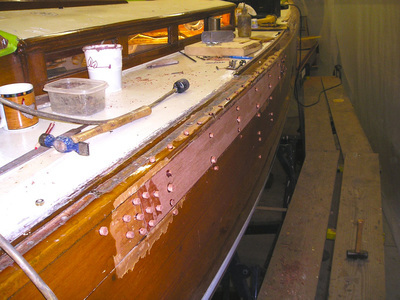 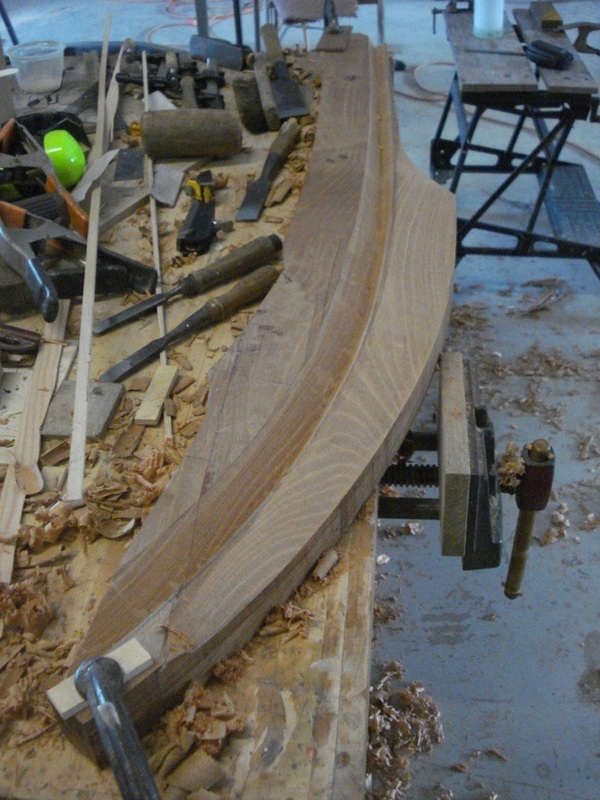 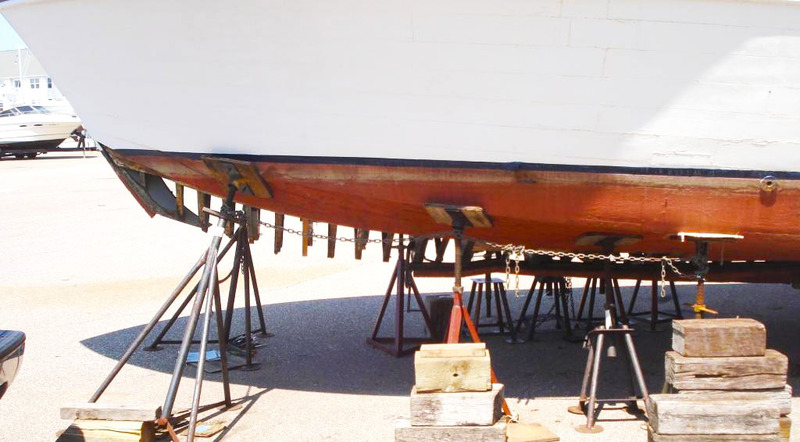 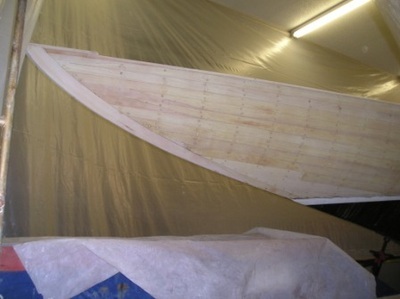 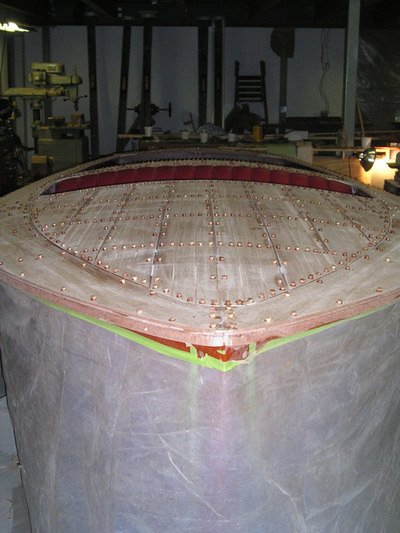 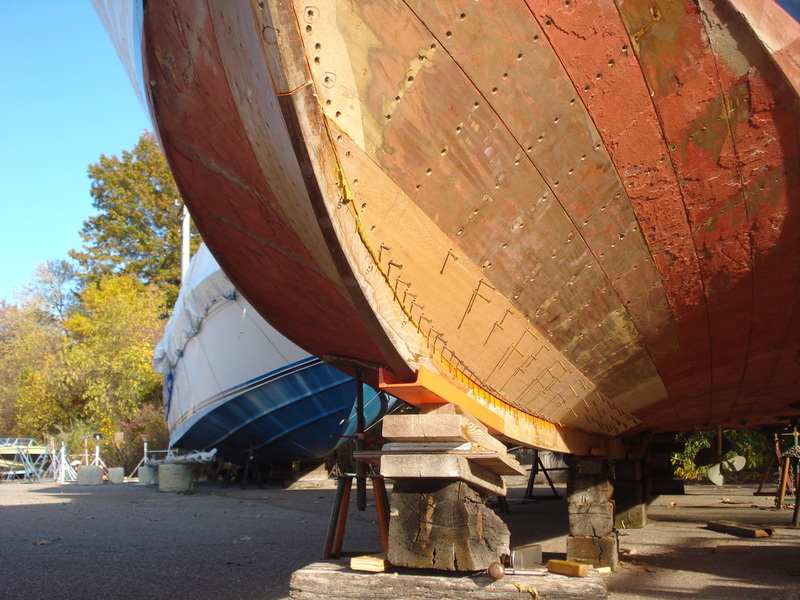 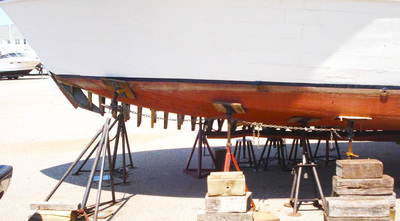 A new keel was fitted back to the original scarph joint with a new forekeel and knee. 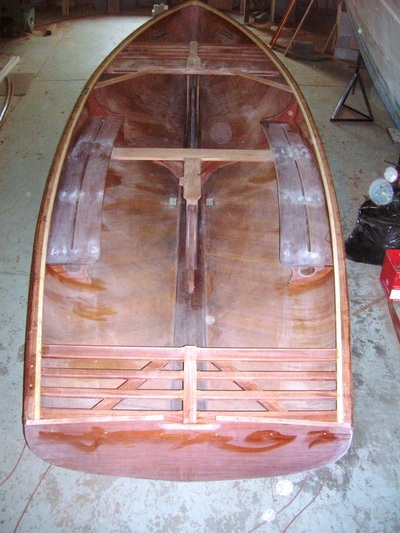 The sawn frames were repaired with new scarphed-in wood and new steam-bent oak intermediates were installed followed by the plywood inner planking and mahogany bottom strakes. 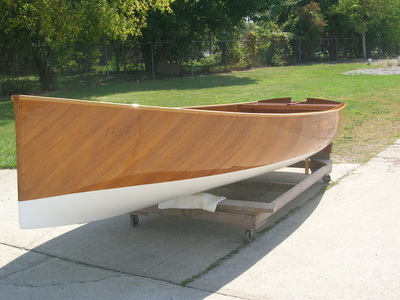 That's how 1950s and '60s-era wooden Thistles often come to us. This featured boat was an exception in terms of her overall care and upkeep but she wasn't the stiff, fair, competitive Thistle her skipper desired, prompting a full rebuild. 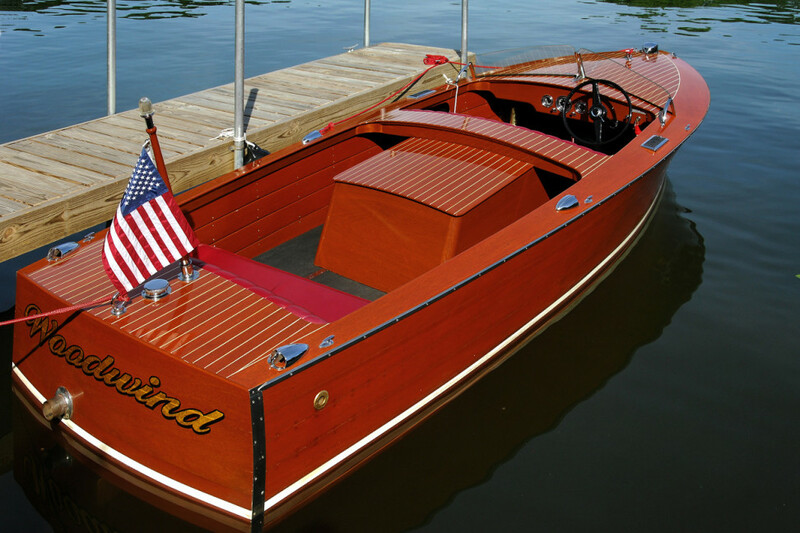 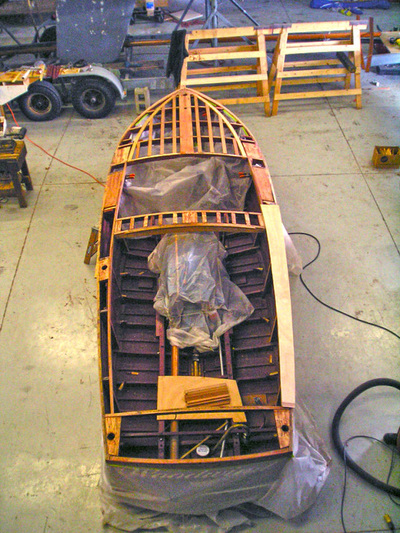 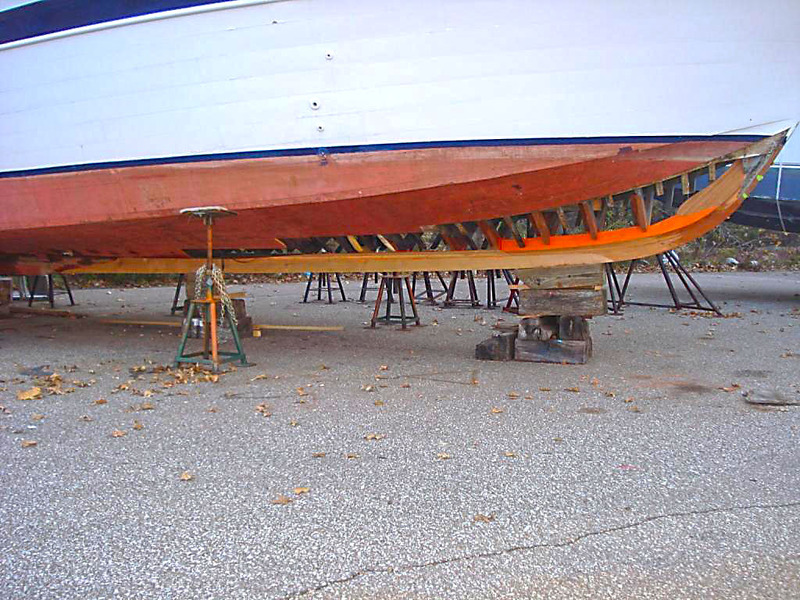 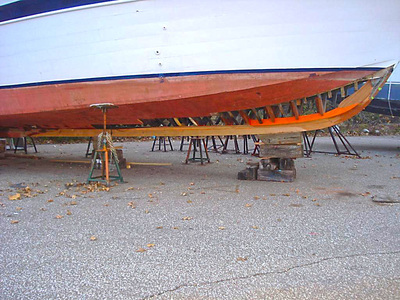 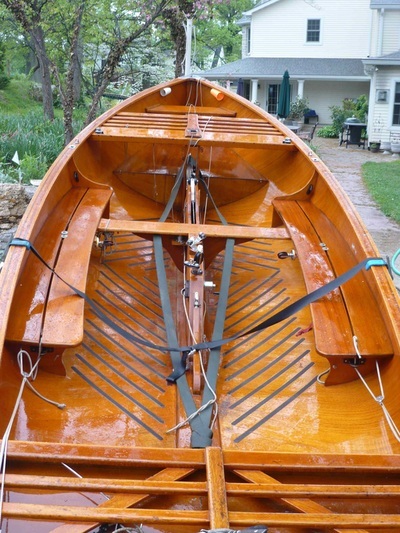 New rails, gratings, seats, transom, and centerboard trunk, along with a number of cosmetic refinements, fairing, and new finishes make this restored Thistle competitive and easy to care for. Click this link to see more Thistle restorations (link is coming soon). 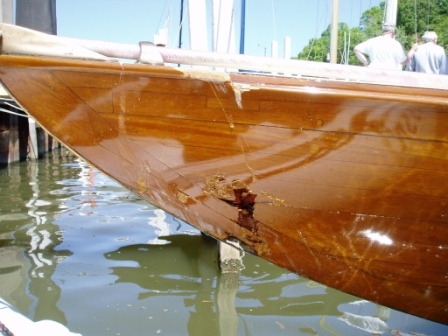 Woodwind first came to us with a badly beaten up starboard side – a combination of high water, strong current, wind and an under-protected dock edge. 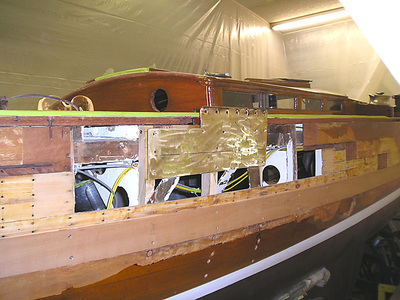 After that repair and a new stain and varnish job to her hull, she came back a year later for new decks, cockpit ceiling and all new interior finish. 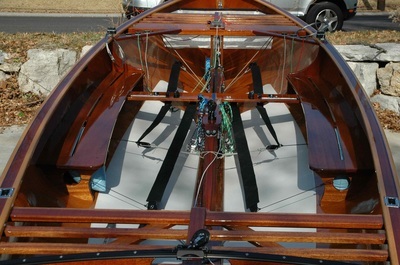 She placed well at the antique shows, her only deductions being in minor details that hadn't yet been addressed (e.g. 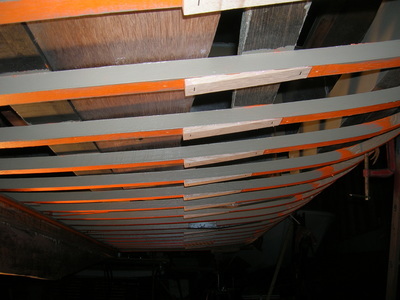 the incorrect floor covering).